In the Tradition of Asanteman, until the brothers in the royal line have been exhausted, rulership does not transcend to nephews. Akwasi Agyemang was a brother to Otumfour Opoku Ware II and the only male of cause along that line and was, therefore, the next person in line. Indeed, Akwesi Agyemang lived the most part of his life in the knowledge that he was well placed to lead the Asantes after the demise of brother, the son of his mother's sister, Opoku Ware II, he revelled at the mention of the name Daakyehene (Future Ruler) because by birth, it was his rightful position. However, Akwasi Agyemang's personal life and record made it impossible for him to be deemed fit for that position and hence Nana Barima Kweku Duah who had the extra advantage of being one of five children Nana Afia Kobi, the Queen Mother who by tradition elects rulers for Asanteman. He was an easy and largely acceptable pick. During the 1979 Coup D'etat, Akwasi Agyemang was the Chairman of KMA, as part of the activities that characterized the revolution, key people were arrested and given all sorts of treatment as punishment. Akwasi Agyemang was one of the prominent people at KMA and so was arrested as part of the revolution. First of all, joining politics was very much frowned upon for royals and more importantly, potential heir apparents. In view of this, it dented his reputation to an extent. As part of the punishment, he was made to carry the toilet in a bucket. It is said that Oyoko ba mbo kashire (kashire is a cloth folded in a ring form to provide support for the head when carrying loads. In view of this, by barring children of Oyoko from using 'kashire', it implied a total ban from carrying anything on the head. Akwasi Agyemang would later become a close friend of Rawlings and a key member of the NDC that when we entered constitutional rule in 92, Rawlings made him the boss of KMA. With this position, Akwasi Agyemang's chances was going to finally hit rock bottom. As if his unpopular switch to the NDC was not enough, his era as KMA boss was marked by violence and intimidations he was closely linked to. He was accused of leading a demolition exercise that vandalised properties of squatters while some of them were still indoors and hence killing scores of people along the line. As the KMA Boss, Akwasi Agyemang functioned as though a ring leader of a cartel. No KMA boss has been accused of anything close to his level of violence and intimidations in the Assembly's History. When the 'slapped one' asked authoritatively, "do you know who I am", the man replied; "of all humans on this earth, the only one I fear is Akwasi Agyemang and so I don't care who you are"
Unusual of him, Kwasi Agyemang told his men to spare the man, so pacifying was the man's admission of him being his scarecrow that the slap felt like a compliment. 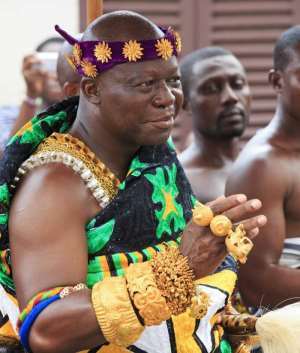 In view of the above negative records of which this article does not reflect even 10% off, when Otumfour Opoku Ware II was about to die, he blessed Kweku Duah as his successor instead of his brother. That though was not binding on the Queen Mother because she is the one mandated by tradition to appoint. However, it fitted every aspect of the narrative, Kweku Duah was his son, he had spent most part of his life preparing for such a moment and never faulted: at least to the knowledge of the public. As part of preparing him for such a moment, he was taken to Sehwi Wiawso instead of the prestigious Prempeh College or Opoku Ware Secondary School purposely to undergo training from the Chief of Sehwi Wiaso. Sehwi Wiawso was part of the Asante Kingdom until they rebelled against the Asantes and accepted the British flag in 1874. 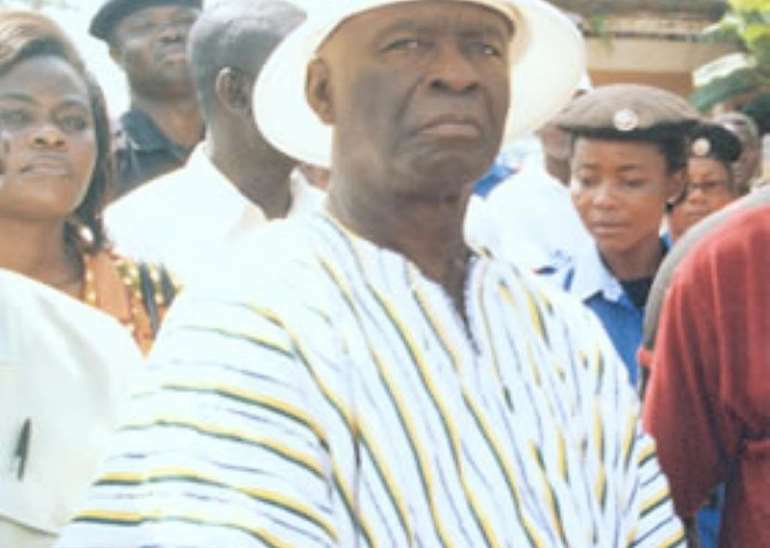 When it became apparent that he was going to be the next Ruler of Asante, Akwasi Agyemang would try to overturn it with what he knew best: violence. With the visible threat of the life of Kweku Duah, protection was needed and fast, the then Regional Minister, Kojo Yankah acted swiftly, deployed military men for his protection until his coronation. Without the backing of the Regional Minister, his own party man, the last-ditch effort proved futile. Defeat to the NDC in the 2000 elections effectively ended the nonsense.